PITTSBURGH, Pa. -- Mike Sullivan was right. The past is the past for the Pittsburgh Penguins. Pittsburgh ended its postseason hex against the New York Rangers emphatically Saturday, lighting up Henrik Lundqvist in a remarkably easy 6-3 rout in Game 5 to win the series 4-1 and advance to the Eastern Conference semifinals. Not this time. Matt Cullen, Carl Hagelin, Conor Sheary and Phil Kessel also scored for the Penguins to end a miserable and brief postseason for Lundqvist, who stopped just 17 of 23 shots and failed to make it to the third period for the third time in the series. Sullivan kept insisting his team's previous playoff meltdowns against the Rangers had no bearing this time around, pointing to a remade roster infused with inexperience and unburdened by previous playoff disappointments. Yet there was a tinge of "uh oh" as New York beat Murray twice in the opening 10:35, doubling its output against him in the previous six periods combined. The 21-year-old Murray dazzled in his first two playoff starts, turning away 47 of the 48 shots in Pittsburgh victories in Games 3 and 4, wins that gave the Penguins control of the series while simultaneously putting the Rangers in a comfortably familiar position. New York's resiliency when facing elimination has practically become a rite of spring for the Rangers, who came in to Saturday 15-4 in situations when a loss would end their season, a run that includes rallying from a 3-1 deficit two years ago against Pittsburgh in the Eastern Conference semifinals, a comeback that sent the Penguins and their star-laden roster into an 18-month malaise that didn't break until Sullivan's arrival as head coach in mid-December. Consider the funk officially over following a 20-minute clinic in the second period that showcased how Sullivan's system - which focuses on playing end-to-end instead of side-to-side - and some midseason roster tweaking by general manager Jim Rutherford have returned Pittsburgh to legitimate Stanley Cup contender status. Tied at two, the Penguins simply skated by the older, slower and decidedly lethargic Rangers. Rust gave Pittsburgh the lead for good by tapping in a pretty feed from Trevor Daley at the top of the slot, the defenseman faking a shot before sliding a pass to Rust at the doorstep 5:21 into the second. The 39-year-old Cullen doubled the Penguins' advantage just over four minutes later when Rust's aggressive forechecking took two Rangers off the puck and left it sitting there for Cullen to whip over Lundqvist's glove. Sheary pushed it to 5-2 when Sidney Crosby skated into the New York zone, drew the Rangers' attention then fed it to the streaking Sheary, whose shot zipped into the top corner. By the time Rust finished off a 2-on-1 by burying a saucer pass from Evgeni Malkin to give the Penguins more cushion than Murray would possibly need, the 421st consecutive sellout at Consol Energy Center was giddily chanting "Hen-rik! Hen-rik!" at the person most responsible for Pittsburgh's recent playoff anguish. Instead this time it will be the Rangers who head into the offseason with questions after losing four games to goaltenders who entered the playoffs with zero combined postseason starts. Jeff Zatkoff sparkled in Game 1 to give the Penguins the early momentum, a game in which Lundqvist exited following the first period after getting scratched in the right eye by a teammate's stick. 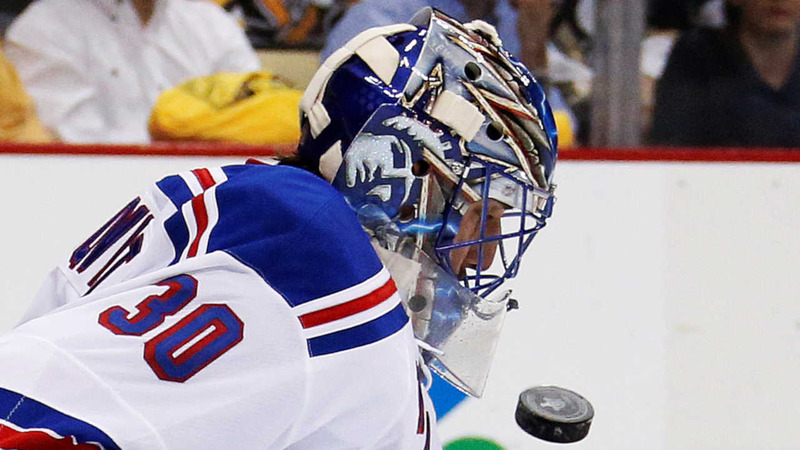 Lundqvist returned to help the Rangers even the series, but it would be New York's last stand. The Rangers were dreadful at Madison Square Garden, stymied by Murray and Pittsburgh's seemingly relentless pressure. When the Penguins' second-period deluge subsided, Lundqvist spent the final 20 minutes of New York's forgettable postseason on the bench in favor of backup Antti Raanta.